Web Essentials has won the Neos Excellence Award in the Neos Awards, which recognize outstanding work with Neos CMS. The ceremony was part of the Neos Conference in Hamburg last Friday, where in between the inspiring talks and workshops our CEO Dominik Stankowski was nervously awaiting the results alongside 24 other candidates. As we live-streamed the ceremony from Cambodia, we were ecstatic to hear Web Essentials called out as one of the 6 winners, and see Dominik take to the stage to accept the award on behalf of the team. The brief for the award was to submit a project that showed outstanding work with Neos, be it excellent technical implementation, brilliant design, high complexity or another noteworthy feature. The 6 award categories were Gold, Silver, Bronze and three Excellence Awards. We chose Swisscom Mailer as a pioneering and complex project that used the core strengths of Neos CMS for a new purpose and shows what Neos is capable of beyond a traditional website project. Together with Sebastian Kurfürst and Christoph Dähne from Sandstorm Media, we adapted Neos to use variables and send out newsletters. Swisscom editors benefit from a custom built mailing solution that integrates with their existing systems and provides the intuitive editing experience Neos is known for. The code was also published open source to benefit the wider Neos community and drive the continued progress of Neos CMS. The jury awarded us the Neos Excellence Award for the technical implementation of Swisscom Mailer. So what does winning this award mean to us at Web Essentials? 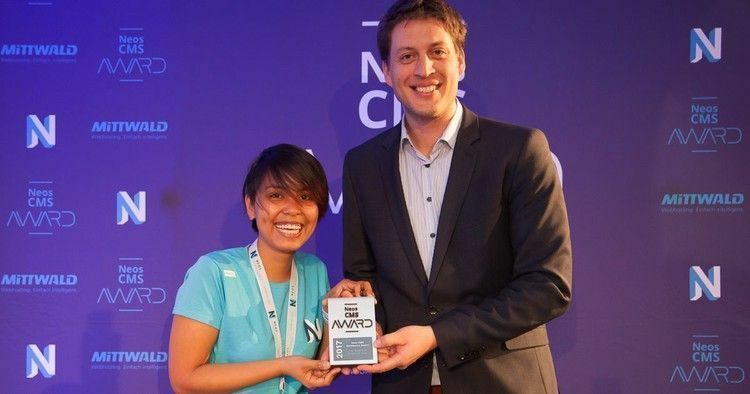 Most importantly, it gives our development teams in Cambodia deserved international recognition for the high quality development work they do from our office in Phnom Penh. To be officially accredited by Neos experts is an important milestone for us as a company, and makes us all very proud of our achievement as a team. Swisscom are also thrilled that the value of the Mailer tool they co-created and use every day is now recognized externally by Neos experts as well as internally. We'd like to thank the jury Andreas Förthner, Christian Müller and Martin Brüggemann for choosing our project as well as conference organizers Sitegeist and award sponsors Mittwald for making the Awards possible. And of course Sebastian and Christoph from Sandstorm Media, whose collaboration helped make Swisscom Mailer the innovative project it is. Find out more information about the Neos Conference and Award. Web Essentials will be hosting the next MEET NEOS event on Friday, May 12 at Kleinhafen in Basel. Early Bird tickets are now available until April 21 2017 for a 50% discount. Find out more information and secure them here. Partner with us to create award-winning websites or web applications: Talk to us today!